In 1967 a Civic Centre comprising a Council Chamber and Civic Hall was opened. On the 8th February 1968 the District of T.T.G. was proclaimed a city. 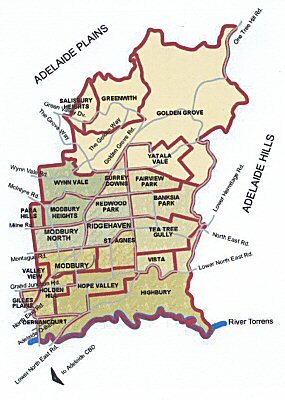 A government Census taken in mid -1855 showed that the population of Tea Tree Gully area was 1440. From 1954-55 to 1971, just 17years, the population started to dramatically climb to 36,708, and in 1975 it had reached approximately 55,000, as people settled in the area from all parts of the globe. By 2004 the population in the District has climbed to over 100,000. An awesome expansion of growth and development for what was once Old Tea Tree Gully- a district of orderly vineyards and orchards, of gullies thickly wooded with native trees, and scattered farms and villages. The Kaurna tribe lived by the Little Para, where Snake Gully Bridge is located, on One Tree Hill road, where there were and still are permanent springs and waterholes. The Little Para waterway and the suburbs of Para Hills and Para Vista are derived from the Kuarna word for water ‘Pari’ (‘water’), a word which is incorporated in the Aboriginal name ‘Karra-wirra-parri’ (River of the Red Gum forest) With some extracts from ‘Settlement to City’ by Ian Auhl), which we know today by the more mundane name of ‘TheTorrens’. Yatala was the name applied by the Weira group of the Kaurnas to the north of the Torrens, extending from Port Adelaide to Tea Tree Gully.The particular section in our own district, was known to the Aborigines as Kirra-Ung-Dinga -‘the place where the Red Gums grow by the creek’-referring it seems to what we call Dry Creek. Tea tree gully was originally just that – a gully.The road to Chain of Ponds and Gumeracha still enters the Adelaide foothills, through the original Tea tree gully. Although there was considerable squatting by stockholders on the streams in the district, there was no permanent settlement until 1839 despite the proximity of the area to Adelaide and it’s popularity with the ‘squatters’. These were people who leased ‘sheep walks’- as they were called – for a few pounds a year and hired shepherds to tend their flocks of sheep. The reason for this was, there could be no permanent settlement without survey, but Colonel Lights surveys’ did not go North of present day Grand Junction road, or East of Reservoir and Reids Road at Hope Valley. A township, called Steventon, grew up in the 1850s at the entrance to the gully, when an Adelaide miller, John Stevens acquired a large grant of land and subdivided it. By 1867 the compilers of Sth.Australian Directories were undecided as to whether to call the village, Steventon or Tea Tree Gully, but after 1900 the name Steventon gradually dropped out of official and common use. Native Tea trees, 10-12ft high once grew in the swampy gully in thickets. The white flowering tree – botanically of the genus Leptospermum – did not long survive the coming of settlement. Today there are very few wild Tea trees growing in the District. The main reason for this is, the damp gullies in the foothills were ideal for market gardening and so the Tea tree was cleared and settlers soon discovered that the tough wood had an in-built resistance to water and used it for fencing in the swampy areas. The Leptospermum family was given its’ popular name Tea tree, when Captain Cook on his first journey to New Zealand, recorded in his journal that his surgeon gathered leaves of the Leptospermum and “brewed a tea which he pronounced to have an agreeable flavour”. In 1862 Ebenezer Ward, a visitor to Anstey’s property at Highercombe, near Houghton, recorded: “we understand that Tea from the tree, which grows wild in these swamps was formally used by labourers in the vicinity and although not equal to Souchong tea, it was pronounced extremely palatable”. Today, the bi-product of the Tea Tree can be found in the market place and is used in many different ways, as an ingredient in shampoo and deodorants’, to antiseptics and rubbing oils, etc. The District of Tea Tree Gully encompasses nearly 50 square miles. Houghton – deriving its name from ‘Houghton Le Spring’ in Durham and was part of a special survey granted to John Barton Hack in 1839. John Richardson acquired 400 acres of this survey in 1840 and named his home, located near present day Inglwood – Houghton Lodge. Here by 1843 there were 7 cottages for labourers and 120 acres enclosed “with posts and four rails”. By 1842 the village had its first inn ‘The Travellers Rest’, its first church in 1843, its first school in 1847 and the first post office in 1848. It was the earliest village in the present district and for a time, hard to believe now, the largest. Hope Valley – named in 1842 by William Holden, the story was told in his reminiscences: “I had gone to town and when I returned I found my premises (Butchers shop and store) had been reduced to ashes, but I could not somehow feel despondent. On the contrary, I felt inspired by hope”- hence the name. .There are three variations of the story which vary in detail, as most stories will in the re-telling, but they all have in common the bush-fire and the expression by Mr Holden that all that was left for himself and those involved was ‘Hope’. In 1849 Hope Valley became a postal town on the mail route to Mt Torrens. Mails were delivered, twice weekly by horse at a cost of four pence a letter. Modbury – Robert Symons Kelly, bought a section of land in 1847, where he built his home, at first a small cottage of rubble stone. His home he named ‘Trehele’ and his farm ‘Modbury Farm’, after his place of birth in Modbury, Devonshire in the U.K.Robert Kelly, as Councillor and member of the Country Road Board, played a large part in the development of Modbury and twice stood for parliament. In 1907 Modbury was described as “a quiet little village, with its store, blacksmith’s shop, chaff-mill, Methodist Church, schoolroom and of course Hotel. It remained a quiet village for the next 50 years. Golden Grove – Was named inadvertently by Adam Robertson,.I say inadvertently because in mid-1859 a correspondent wrote to the ‘Register’ to complain, “at Golden Grove, we are without a post office and must trudge 3 or 4 miles for our epistles and be dependant on the butcher or on casual travellers”.The little agricultural village was given a post office, but when authorities took it upon themselves to name the new postal town Golden Grove, a local resident, Adam Robertson, was incensed. He wrote to the Register to explain that Golden Grove was the name of his farm “and not of the country roundabout”.However and very politely, another correspondent reminded Adam Robertson that in 1853, he had conferred the name on the public school, “ therefore the settlers cannot be blamed for extending it to the village itself”.